As McDonald’s own suggested employee budgets indicate, it’s not easy to support yourself or a family on just a job behind the counter of a fast-food restaurant. And a new study claims that the 52% of non-management fast-food workers who take home some sort of federal subsidy are costing taxpayers around $4 billion a year. 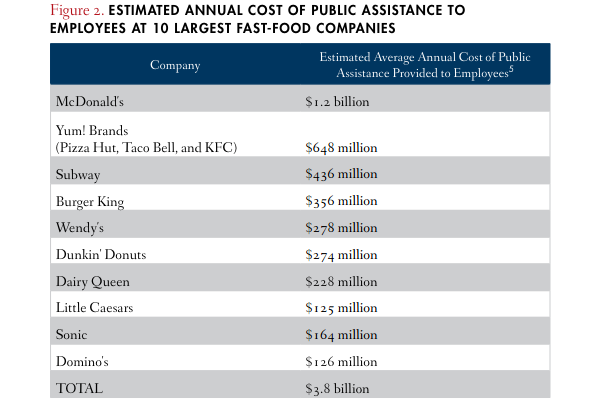 The report [PDF] from the National Employment Law Project looks at how much is paid out in social welfare benefits to non-management employees at the nation’s 10 largest fast food chains. As you can see from the chart above, McDonald’s workers alone receive an estimated $1.2 billion in public assistance from taxpayers. This is followed by Yum! Brands — including Pizza Hut, Taco Bell, KFC — all of which total to around $648 million a year. Subway ($436 million), Burger King ($356 million), and Wendy’s ($278 million) round out the top five. “[T]he overwhelming share of jobs in the fast-food industry pay low wages that force millions of workers to rely on public assistance in order to afford health care, food, and other basic necessities,” reads the report, which points out that many of these companies have the profits to pay workers enough that would equal their wages plus what they receive in subsidies. NELP has been one of the organizations pushing for increases in both the national minimum wage and the wages paid to foodservice workers, so critics of the study say it is taking a simplified view of the situation.